In an account partner organization, administrators create claims to represent a user's membership in a group or role or to represent some data about a user, for example, a user’s employee identification number. In a resource partner organization, administrators create corresponding claims to represent groups and users that can be recognized as resource users. Because outgoing claims in the account partner organization map to incoming claims in the resource partner organization, the resource partner is able to accept the credentials that the account partner provides. You can use the following procedure to add a claim. Expand Service and on the right click Add Claim Description. 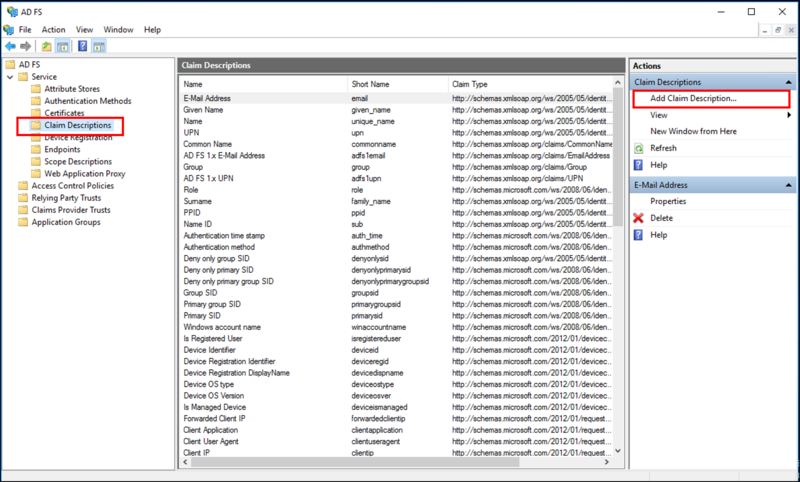 On the Add a Claim Description dialog box, in Display name, type a unique name that identifies the group or role for this claim. In Claim identifier, type a URI that is associated with the group or role of the claim that you will be using. Under Description, type text that best describes the purpose of this claim. - To publish this claim to make partners aware that this server can accept this claim, click **Publish this claim in federation metadata as a claim type that this Federation Service can accept**. 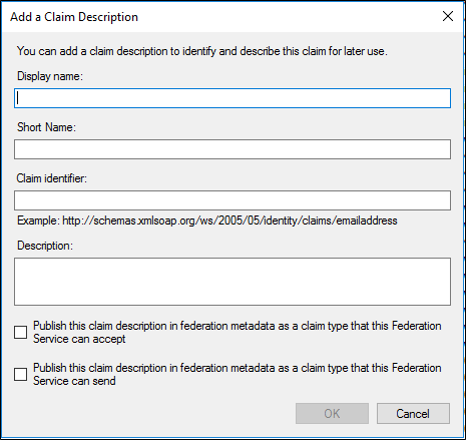 - To publish this claim to make partners aware that this server can issue this claim, click **Publish this claim in federation metadata as a claim type that this Federation Service can send**.